Spectacular, huge fully double deep pink and heavily speckled blue fantasy stars. The fantasy stars have an irregular, pencil-thin white edge. Dark green, red-backed, quilted foliage. 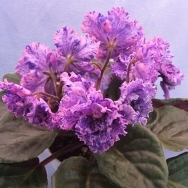 This beautiful violet is a lovely addition to your collection.